In March, the National Institute for Health and Care Excellence (NICE) published new quality standards on vaccine uptake in the under 19s. Here are its recommendations. According to the World Health Organization (WHO), the two public health interventions with the greatest impact on the world's health are clean water and vaccines. The UK's national immunisation programme has meant that dangerous diseases, such as polio, have disappeared, although they remain prevalent in other parts of the world. But in some areas one in ten children are not being vaccinated against diseases including polio and diphtheria, while only a quarter of local authorities met the WHO's target of 95% of children being vaccinated against measles, mumps and rubella (MMR). In March, the National Institute for Health and Care Excellence (NICE) published new quality standards on vaccine uptake in the under 19s. There are five recommendations. These include: children not attending immunisation appointments should be followed up by telephone or text; those who missed a vaccination should be offered it again; a child's immunisation status should be checked at specific educational stages; and young offenders should be checked on entry into a secure setting, and offered any outstanding vaccinations. Routine vaccinations begin when a baby is eight weeks old. Delays in vaccination at the recommended time can mean a lack of protection against illnesses that are often more common and worse in younger children. This includes babies who are born prematurely, who may have a greater risk of contracting infections than those born on time. 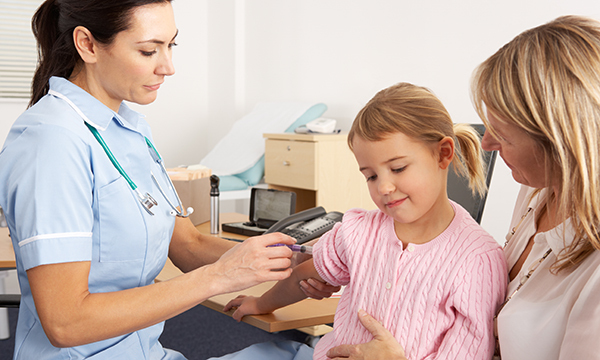 The NHS Immunisation Statistics for England in 2015-16 show that 93.6% of children reaching their first birthday had completed their primary vaccination courses against diphtheria, tetanus, pertussis, polio and haemophilus influenza type b. There is regional variation, with the highest rates of routine childhood immunisation recorded in the north east and the lowest in London. In addition, the statistics show that coverage of the first dose of the MMR vaccine for those reaching their second birthday decreased to 91.2%, continuing a downward trend from the previous two years of 92.3 and 92.7%. NICE estimates that as many as three million children may have missed their MMR vaccine. Before immunisation was widely available, each year in the UK half a million children caught measles and 100 died from it. Mumps can cause permanent deafness, viral meningitis and encephalitis, while rubella can have devastating effects on unborn children, including on their sight, hearing, heart and brain. Nurses are pivotal in the UK's immunisation programme, both helping to deliver it and ensuring that parents understand the importance of having their child vaccinated at the right time, to ensure protection. Nurses can also encourage those who may have missed any routine vaccinations to have those that are outstanding, explaining the benefits. 'Nurses play such an important role in the vaccination of children and young people, so I think it's really important that our views have been taken into account in the development of these standards. 'One of the key themes is ensuring systems are in place to allow identification and follow-up of children and young people who are not up-to-date with their vaccinations, and so remain at risk from vaccine preventable diseases.